(TibetanReview.net, Sep04, 2014) – It is not just in Tibet but in Xinjiang (East Turkestan) as well that China is offering all kinds of incentives to entice local ethnic minorities to marry the dominant immigrant population, seeing this as a means to ensure a speedy homogenization of these territories. Xinjiang’s Qiemo County government announced on Monday (Sep 1) on its website that it is giving out an annual 10,000 yuan ($1,627) cash reward for five years for mixed marriage couples following their marriage, reported China’s official Global Times newspaper Sep 3. The policy also offers family members of mixed marriage couples privileged access to housing, education, employment and welfare benefits, the report added. But following increasing media scrutiny, the authorities have stopped publicizing the policy, but continue its implementation. “We are no longer publicizing the policy, but we will still go ahead with it,” the report quoted an official from the county’s government office as saying. The rewards for marrying a Chinese man or woman are enormous. Ninety percent of these couples’ medical expenses after insurance fees will be covered by the local government, the report said. And their children will also be exempt from school fees within the county until high school, while an annual 5,000 yuan scholarship will be given to those who reach university. Their parents will also be eligible for housing and medical benefits if their marriage lasts longer than three years. 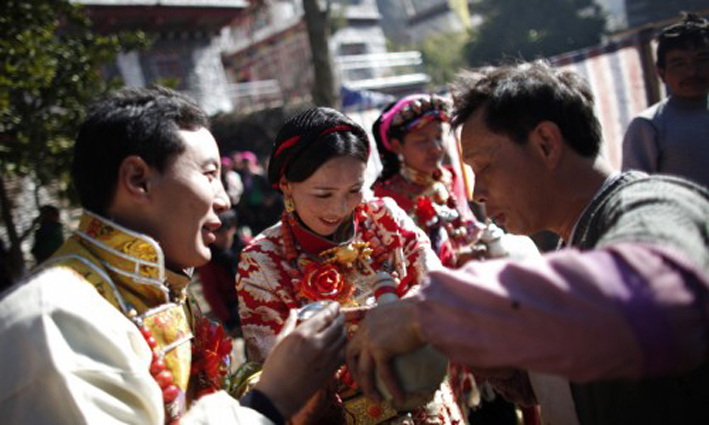 “Our county has a lot of ethnic minorities with their own religious beliefs, but through Han-minority mixed marriages we can strengthen ethnic unity,” a publicity official with the county was quoted as having said earlier in an interview with the Financial Times. While a report by the research office of the Communist party in the Tibet Autonomous Region had noted that interethnic marriages in the region had grown from about 700 in 2008 to more than 4,700 last year, such mixed marriages are said to be rare in Xinjiang, according to the Global Times report. Chinese Panchen tipped for ministerial rank?